© Madeline Marshall. Used with permission from West End Cinema. 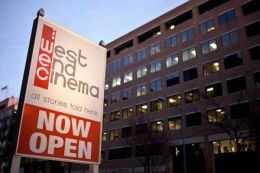 Opened as the West End Cinema on October 29, 2010 by owner Josh Levin. It closed March 29, 2015. Reopened by Landmark Theatres on July 17, 2015 as the two-screen Landmark West End Cinema. This movie theater is near Washington, Falls Church (VA), DHS (VA), Reston (VA), McLean (VA), Sterling (VA), Lorton (VA), Springfield (VA), Columbia (MD), Mc Lean (VA), Arlington (VA).